Po is a noodle-slurping dreamer who must embrace his true self - fuzzy flaws and all - in order to become the Dragon Warrior. $60.239 million on 4114 screens. In 2008’s animated adventure Kung Fu Panda, we meet Po (voiced by Jack Black), a furry employee at his family’s noodle restaurant. He wants to become a kung fu master but it looks like he’ll be stuck in the noodle biz forever. This changes, however, when he learns that a tournament will find a Dragon Warrior to handle an imminent threat from Tai Lung (Ian McShane), an evil snow leopard bent on revenge against the citizens of the Valley of Peace. When Po accidentally lands in the middle of the tournament, something decidedly unexpected occurs: Master Oogway (Randall Duk Kim) chooses the interloping panda as his Dragon Warrior. Despite his protests, second-in-charge Master Shifu (Dustin Hoffman) gets the assignment to train Po. Will our fuzzy hero learn the skills to fight Tai Lung and stand next to his heroes, the Furious Five? Yeah, probably – watch the movie yourself to find out what happens. Although I love the big summer flicks and animation, I passed on Panda during its theatrical run. I never much cared for kung fu stories, and parodies of that genre seem to be done to death. Add to that my general disinterest in Jack Black and I saw little reason to drop 10 bucks on this one. This means I went into my home screening of Panda with pretty low expectations, which I suppose the flick surpassed, but that’s mostly because I didn’t think I’d like it at all. Instead, I thought the film provided a reasonably entertaining experience, but it just never became anything more memorable than that. Actually, some parts of Panda work very well. The movie features lush visuals that become stunning at times. I can’t think of many animated flicks that look so good, and the lavish visuals really add to the experience. In particular, the death of one character came across as a beautiful scene. I didn’t anticipate such lovely and moving material here, so the film scores high points for its animation and design. Panda also comes with a pretty solid cast. Admittedly, I’m not a big fan of Black’s work, and he offers his usual blustery performance here much of the time. Black does manage to tame his shtick to a decent degree, though, and he makes Po a reasonably likable protagonist. The rest of the performers give the movie most of its appeal, though. McShane is great as the villain, and Hoffman tones down his increasingly hammy ways to make Shifu a surprisingly three-dimensional character. The kung fu master may be the best-realized role of the bunch, largely due to Hoffman’s fine performance. David Cross is also quite effective in his small role as Crane, and the others bolster the flick well. Unfortunately, Panda loses some points in terms of its story. Granted, I don't expect especially deep plots from animated movies. Taken from the Disney model, their inventiveness tends to come from characters and humor, but they usually go with simple morality tales. That’s what we get here, as Panda follows the basic “believe in yourself” model that’s long been a staple of Disney flicks. I don’t fault the simplicity of the story so much as I don’t care for the ordinary way in which Panda pursues its plot. We can see so many of the twists coming from a mile away, and the film doesn’t execute them with much creativity. As I mentioned, other animated flicks may come with similarly ordinary stories, but they spice things up with better humor and other complexities. Panda never bores, but it simply lacks a great spark. That leaves Kung Fu Panda as an enjoyable flick. I really like it gorgeous visuals and think it comes with more than a few positives. However, it just doesn’t rise above the level of decent entertainment. End credits footnote: stay until the movie’s conclusion to find a cute little coda. Kung Fu Panda appears in an aspect ratio of approximately 2.35:1 on this Blu-ray Disc. As expected, this became a terrific transfer. Sharpness looked strong. No softness emerged here, as the movie always seemed concise and well-defined. I noticed no issues connected to shimmering or jagged edges, and edge enhancement never materialized. Of course, the computer-animated affair came without source flaws, so don’t worry about any specks, marks or other defects. With its exotic settings and characters, Panda featured a broad palette that looked great. The movie’s colors leapt off the screen, as they offered excellent vivacity and impact. Blacks were concise and dark, and shadows seemed clear and well-defined. Overall, Panda provided lively visuals. Though not as memorable, the Dolby TrueHD 5.1 soundtrack of Kung Fu Panda seemed positive. In the forward domain, the music showed fine stereo imaging, while effects blended together neatly and smoothly. Those elements moved from speaker to speaker cleanly as the track created a solid sense of atmosphere. It even included a fair amount of dialogue from the side speakers, which offered a good impression of breadth. Surround usage generally favored reinforcement of music and effects, but the rears came to life nicely during a number of scenes. Various battles showed effective use of the surrounds, as did the other action sequences. The mix really helped bring the material to life. Audio quality consistently seemed positive. Dialogue was natural and distinct, and I heard no problems related to intelligibility or edginess. Music was rich and warm throughout the movie, with good clarity as well. Bass stomped to life nicely during the louder scenes and effects always seemed clear and accurate, with no signs of distortion or other concerns. This was a nicely engaging soundtrack that earned a solid “B+“. This set includes both 2D and 3D versions of Panda. The picture comments above reflect the 2D edition – how does the 3D compare? In terms of picture quality, both look virtually identical. If the 3D image lost anything in terms of sharpness, colors or blacks, I couldn’t see the decline – the 3D version offers excellent visuals. As for the stereo imaging, Panda comes with terrific 3D impressions. The many action scenes leap off the screen, especially when they involve aerial/flying elements, which often occurred. General depth looks immersive, and those livelier sequences add real spark to the proceedings. Panda packs a strong 3D punch. All the set’s extras appear on a DVD copy that replicates the original 2008 release. We begin with an audio commentary from directors John Stevenson and Mark Osborne. Both sit together for this running, screen-specific chat. They look at animation and visual design, color schemes and cinematography, cast and performances, story and characters, action choreography, and some other production specifics. A lot of commentaries for animated films tend to be dry and technical, but that problem doesn’t happen here. Oh, we get lots of nuts and bolts information, but Stevenson and Osborne keep the track moving well and they balance the technical bits with more creative elements. They provide a consistently lively and interesting discussion. Three featurettes follow. Meet the Cast goes for 13 minutes, 14 seconds as it presents remarks from Osborne, Stevenson, and actors Jack Black, Dustin Hofffman, Angelina Jolie, Jackie Chan, Lucy Liu, Seth Rogen, David Cross, Ian McShane, Michael Clarke Duncan, Randall Duk Kim, and James Hong. We get some notes about cast, characters and performances. Don’t expect much depth here, as the comments remain fluffy and insubstantial. I always enjoy shots of the actors at work, though, so that side of things satisfies. Pushing the Boundaries goes for seven minutes, four seconds and features Osborne, Stevenson, chief technology officer Ed Leonard, artistic supervision: character technical direction Nathan Loofbourrow, supervising animator/kung fu choreographer Rodolphe Guenoden, production designer Raymond Zibach, artistic supervision: surfacing Wes Burian, visual effects supervisor Markus Manninen, DreamWorks animation CEO Jeffrey Katzenberg and artistic supervision: character effects/crowds and effects Alex Parkinson. We learn a bit about the computer animation here - but only a bit, as we don’t get much detail. Instead, the participants mostly tell us how amazing and complex the project is. I like the shows of the raw visuals, but we just don’t learn a whole lot from this featurette. Next we find the three-minute and 52-second Sound Design with remarks from Osborne, Stevenson, and supervising sound editors/sound designers Erik Aadahl and Ethan Van der Ryn. This show tells us about some of the film’s auditory choices. As usual, the behind the scenes elements work best, as we get some fun shots of the sound crew at work. Not too many details emerge, though. A Music Video pops up for Cee-Lo’s cover of “Kung Fu Fighting”. As usual, we get some movie clips, but the video’s usually more creative than that – though not tremendously so. We see some kung fu-influenced choreography and a cameo from Jack Black. It’s a mediocre video, but at least it’s better than the usual slop. After this we locate a few educational pieces. Mr. Ping’s Noodle House runs four minutes, 40 seconds and provides narration from Iron Chef America host Alton Brown. We watch the creation of Chinese noodles in this short featurette. It’s mildly interesting at best. How to Use Chopsticks goes for two minutes, 55 seconds and acts as a tutorial. It teaches us the correct way to use chopsticks. Y’know, spoon/fork/knife have served me well over the years, so I think I’ll stick with them. Besides, there’s nothing more pretentious than white folks using chopsticks. I don’t know how valuable this lesson will be, but if you want to join the chopstickers, give it a look. For some real-life info, we head to the one-minute, 57-second Conservation International: Help Save Wild Pandas. Hosted by Jack Black, it tells us what we can do to contribute to the preservation of pandas. It’s propaganda, but it’s painless propaganda. Next we find Dragon Warrior Training Academy. This offers a series of games to see if you’re worthy of the “Dragon Warrior” title. As is usually the case with DVD games, these are more annoying than fun. Printables and Weblinks offers various kid-oriented activities. These require computer access, so pop the disc into your DVD-ROM drive to give it a go. Finally, we get a DreamWorks Animation Jukebox. This lets you see/hear songs from Shrek, Shrek 2, Shrek the Third, Bee Movie, Flushed Away, Over the Hedge, Madagascar and Shark Tale. All of this feels like glorified advertising to me. A few ads open the DVD. We get clips for Monsters Vs. Aliens, Madagascar: Escape 2 Africa, and Secrets of the Furious Five. These also appear in the disc’s Trailers area. No ad for Panda appears here. 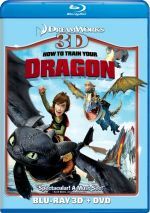 The 3D disc includes a 3D trailer for Puss In Boots. While not a classic piece of animation, Kung Fu Panda provides decent entertainment. I’ve certainly seen less amusing films, so that may not be a great endorsement, but it beats a more negative assessment. The Blu-ray delivers excellent picture and audio along with some useful supplements. 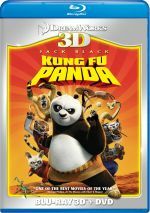 Panda becomes an enjoyable tale and a high-quality Blu-ray, one that becomes more fun in its 3D incarnation.